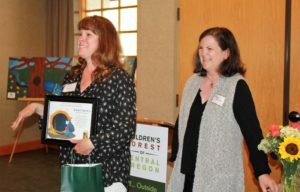 The Children’s Forest of Central Oregon hosted its first Awards Ceremony on Thursday, June 21 to celebrate the inspirational work by community organizations, businesses, public agencies, teachers, and youth to connect children and families with the wonder, science, and adventure of nature. 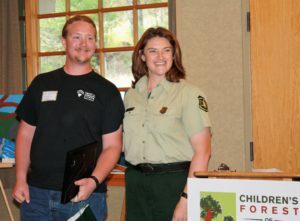 The mission of the Children’s Forest is “to unite our community to inspire lifelong connections to nature for all kids,” and this event brought together the many individuals and organizations who are a part of this movement in Central Oregon. 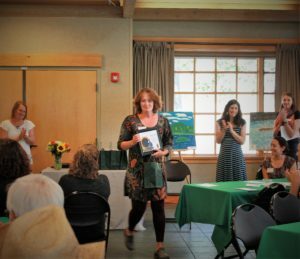 This was the first year for the Children’s Forest Awards Luncheon, which will be held biannually. Jackie has an amazing impact on students every day. She understands the value of getting kids into outdoor classrooms and engaged in experiential learning opportunities. Even in her first year of teaching at Bear Creek, not only has Jackie provided many outdoor opportunities for her own class, but has researched and organized opportunities for all grade levels. Many teachers see the challenges of today’s teaching reality as a barrier to taking students beyond the safety net of the school walls. The increased intensity of disruptive student behaviors, and a higher prevalence of students suffering from Adverse Childhood Experiences has changed the dynamics of today’s classroom and learning environment. Jackie has seen outdoor learning opportunities as the exact thing that these students need to be inspired and motivated to work hard in the classroom. Jackie builds those experiences into her everyday teaching so that kids are exposed, understand, and apply them to their thinking. 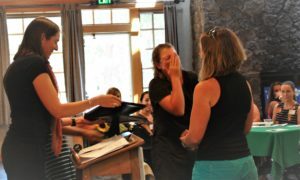 In just one year of working with Jackie at Bear Creek, it is clear that her passion for the environment, along with her passion for engaging students in their learning is the perfect combination of what we want in every classroom in Central Oregon. 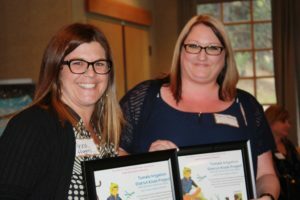 Environmental Educator of the Year: Tory Kurtz and Jen Mickelson, Ochoco National Forest & Crooked River National Grassland. Tory and Jen bring extraordinary outdoor learning opportunities to thousands of Crook and Jefferson County students each year. 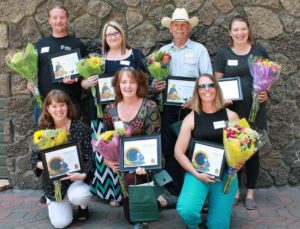 Schools, teachers, and administrators in Prineville, Powell Butte, and Culver have come to rely on Jen and Tory for many of their natural resource education programs. Their programs have included starting a Youth Watershed Council at Culver High School, leading Powell Butte students on stream restoration projects on public lands, enlisting students to gather and compile monitoring data that feeds into agency environmental analysis, helping with storyline projects focused on camping, ranching, and “Riverkeepers”, and leading an annual outreach event called Fin, Fire, Feathers for hundreds of students. They are seen as leaders in environmental education both within the workplace and within the community and they do all of this in addition to their natural resource management jobs and responsibilities. Chuck is a huge supporter of connecting youth to the natural world. For 15 years, he has volunteered with local schools to help lead outdoor education activities. He dedicates hundreds of hours each year to facilitate hands-on outdoor education activities, stewardship projects, and outdoor recreation trips for Central Oregon students. 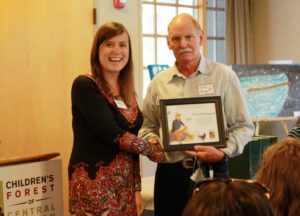 Chuck has been a generous supporter of Upper Deschutes Watershed Council’s education program, making it possible for hundreds of students to connect with stewardship projects on local streams and rivers each year. Chuck has also served on Upper Deschutes Watershed Council’s board for many years and actively advocates for outdoor education opportunities for local students in the community. Innovation Award: Tumalo Irrigation District Kiosk Project with REALMS Middle School and the Tumalo Irrigation District. Specifically, we’d like to recognize Karen Holm and Eric Beck, REALMS teachers, for their leadership of this project. In collaboration with Tumalo Irrigation District, REALMS 8th grade students have been researching, planning, and designing a series of 12 informational kiosks to be built along the Deschutes River downstream from First Street Rapids. Students have become experts on complex topics including water quality, altered water flows, water use, the role of the Irrigation District, and water conservation strategies. 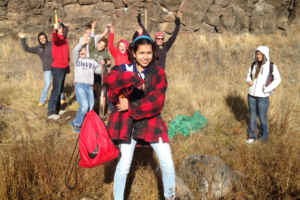 The project masterfully combines classroom time with authentic fieldwork experiences, connecting students in powerful interdisciplinary science, math, humanities, and art education that propels them beyond the role of student and into the role of steward and citizen. Along the way, students have enhanced their understanding of water quality, river health, and human connections with our watersheds. Through the creation of the kiosks, we hope to deepen the public’s understanding of the inter-connectedness between people, place, and our watersheds. This is a great example of powerful community partnerships and students doing “real work” that contributes to improving their community. Karen Gentry works to make all Discover Your Forest programs inclusive for all individuals, and is incredibly passionate about ensuring that all participants feel comfortable, deeply engaged in learning, and have fun. Karen has developed specialized programs for groups from Abilitree, Deschutes County Mental Health, Society for the Blind, the Academy at Sisters, and many others. She has also developed an innovative program called Greenhouses to Greenscapes, in which Life Skills students from local high schools grow native plants in greenhouses and participate in restoration projects on public lands. In addition to leading programs, Karen actively trains Discover Your Forest volunteers on best practices for working with students with disabilities. Karen is an incredibly talented and creative educator, who is genuinely interested in each person experiencing the natural world to their fullest ability. Outstanding Youth: Joe Whitlatch, Heart of Oregon Corps and the U.S. Forest Service. Joe serves on Heart of Oregon Corps AmeriCorps Prineville crew and is a true inspiration to Heart of Oregon’s staff and corps members. Joe is an extraordinary leader and peer mentor, with an innate ability to connect with and motivate young people who face challenges and barriers. As a member of his crew, he reaches out with humor and kindness and brings everyone into the circle. Whether it is training a corps member how to use a chainsaw or stepping into a leadership role while on a project, Joe’s enthusiasm and dedication to being a positive force in his community is contagious. Beyond his service with Heart of Oregon Corps, Joe has had an incredible impact on the youth of Crook County, volunteering with the Prineville Youth Theater Camp and also serving on Crook County’s Search and Rescue team. Joe’s commitment to making his community stronger, safer and better connected to nature, both local and beyond, is exemplary. We are thrilled that Joe was selected for and accepted a seasonal position with the U.S. Forest Service in Silver Lake and will be continuing his journey to inspire natural resource stewardship in his community.